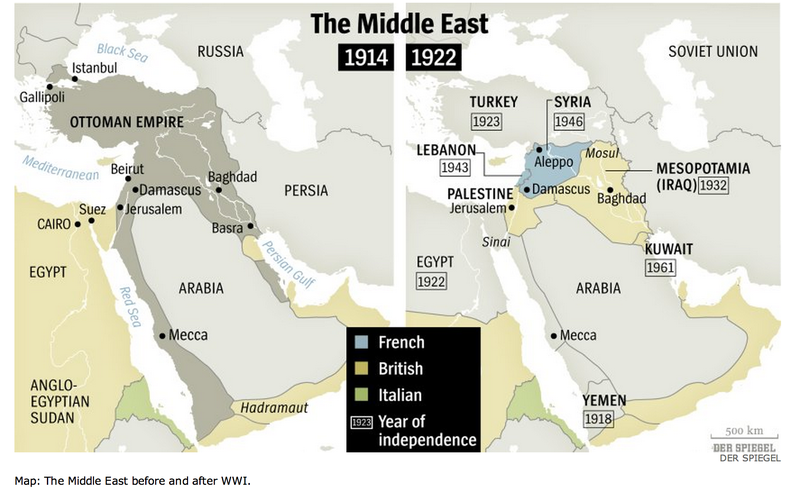 The Allies were rolling now. 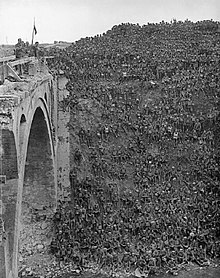 The Second Somme came to an end on 3 September, and Foch determined to launch a broad assault on the Hindenburg Line (Siegfriedstellung). 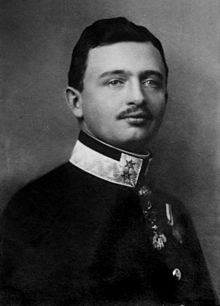 First, though, he cleaned up the German salients west of the Line in order to attack the entire string of fortifications at once. 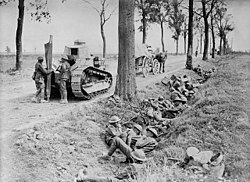 The British and French advanced towards the Line in a number of relatively small engagements, heading for Cambrai, Saint-Quentin and Laon. 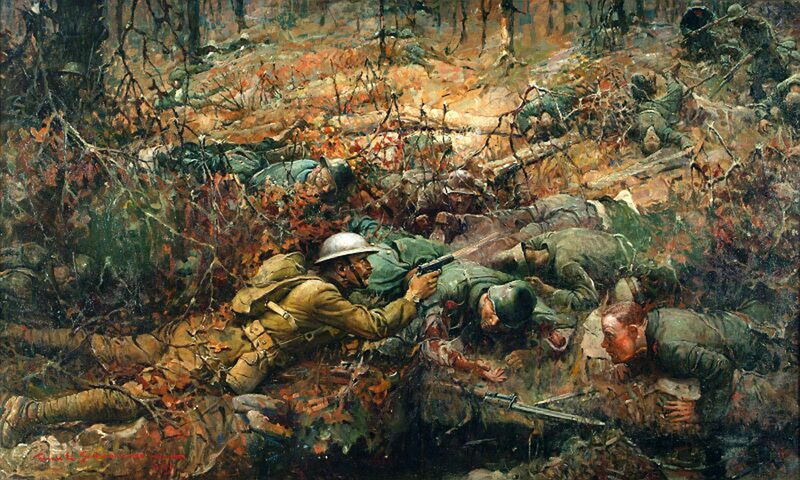 By 25 September the Germans were pushed back to the Line, having surrendered all the gains of their Spring Offensive. 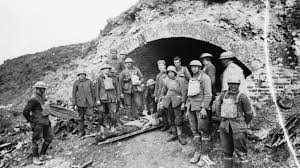 The Allies nevertheless still believed the War could not be won until 1919. 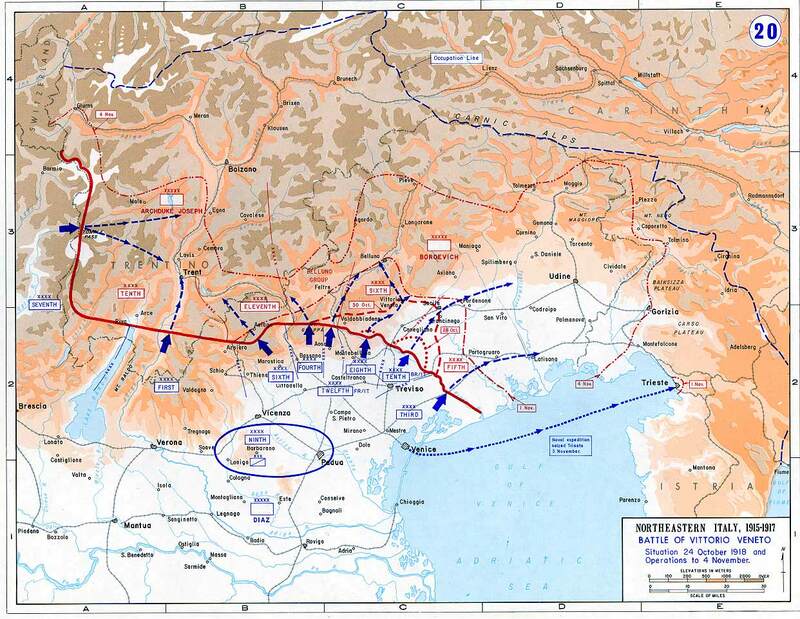 One part of this operation was the Battle of Saint-Mihiel on 12-15 September, the only American-directed major offensive of the war. 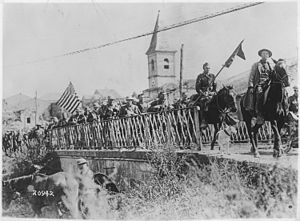 Pershing’s First Army (14 American and 4 French divisions) easily cleared the Saint-Mihiel salient – the Germans were already in retreat – but as usual with successful advances the troops (660,000 of them) got ahead of their supplies and artillery and were forced to halt rather than attempt a breakthrough to Metz. 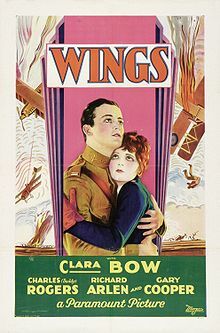 The Battle of Saint-Mihiel, incidentally, was recreated in the 1927 movie Wings, which won the first Academy Award for Best Picture; it also involved the first recorded use of the term D-Day. 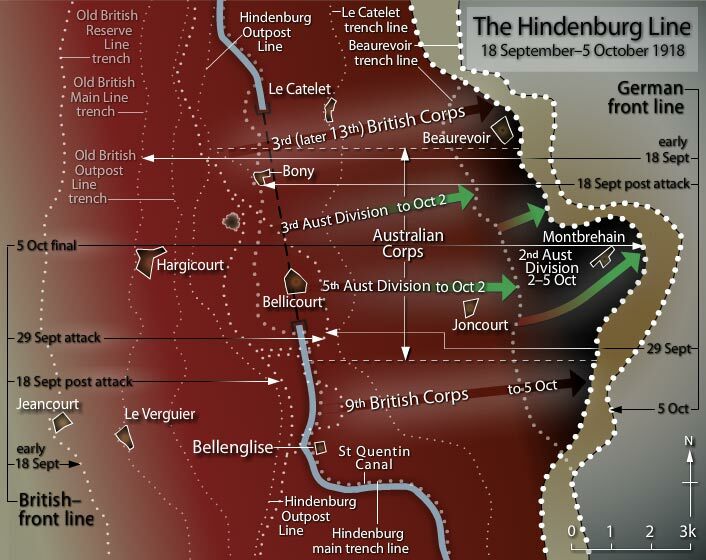 The grand assault on the Hindenburg Line kicked off on 26 September with the Meuse-Argonne Offensive, which would last until the Armistice. 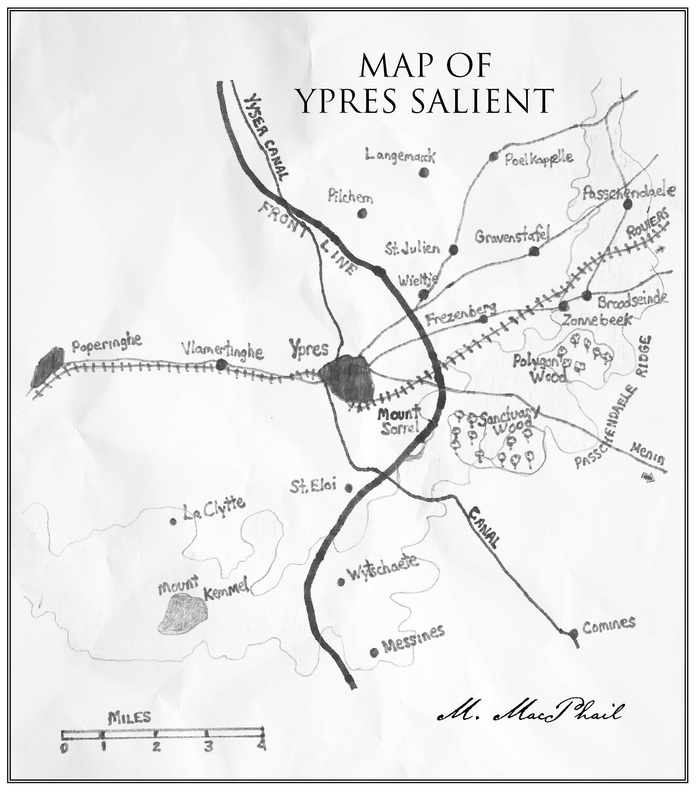 The strike was launched from the southern (Verdun) sector, and the ultimate objective was the city of Sedan, which was an absolutely vital lateral rail hub for the Germans (and the scene of their victory over France in 1870). 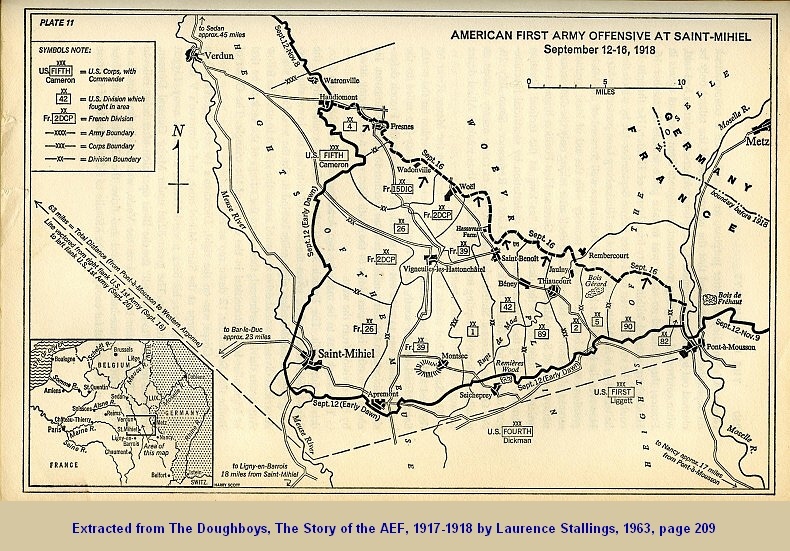 The strike force consisted of 15 (later 22) American divisions, which were anywhere from 30% to 100% larger than the European, and 31 French divisions, for a total of 1,200,000 men; they were accompanied by 2780 guns, 380 tanks and 840 planes. 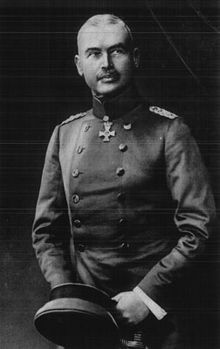 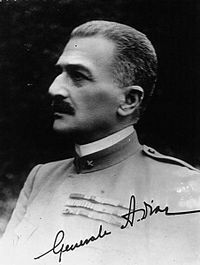 Facing the Allied force were ultimately 44 German divisions, most of them half strength, totaling up to 450,000 generally demoralized men under Fifth Army commander Georg von der Marwitz (remember him?). 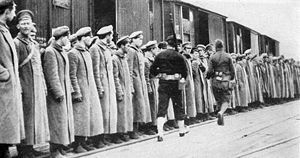 In terms of personnel the operation was a partial role call for America’s next war. 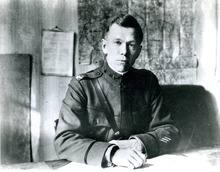 Handling the massive Allied logistics was Colonel George Marshall, who as Chief of Staff of the Army would in the Second World War oversee the expansion and supply of the entire US army and the rebuilding of Europe. 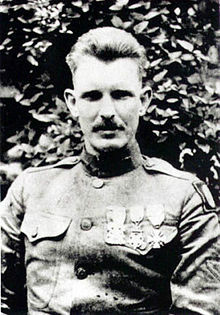 Vigorously leading an infantry battalion was Colonel William “Wild Bill” Donovan, who would create and direct the Office of Strategic Services, the precursor to the CIA. 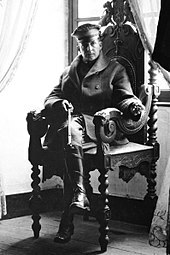 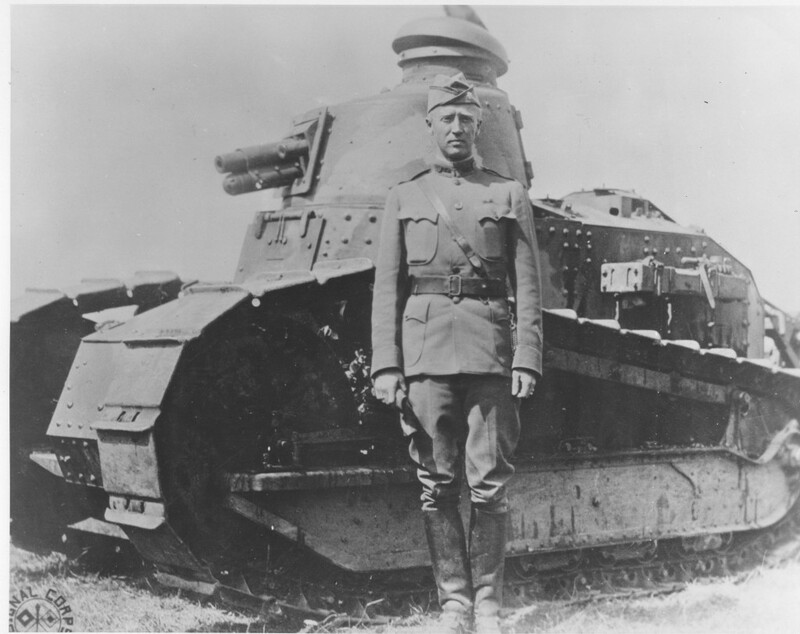 Colonel George Patton commanded a tank brigade, while an infantry brigade was under General Douglas MacArthur. 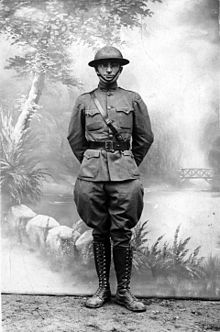 And managing an artillery battery was Captain Harry Truman. 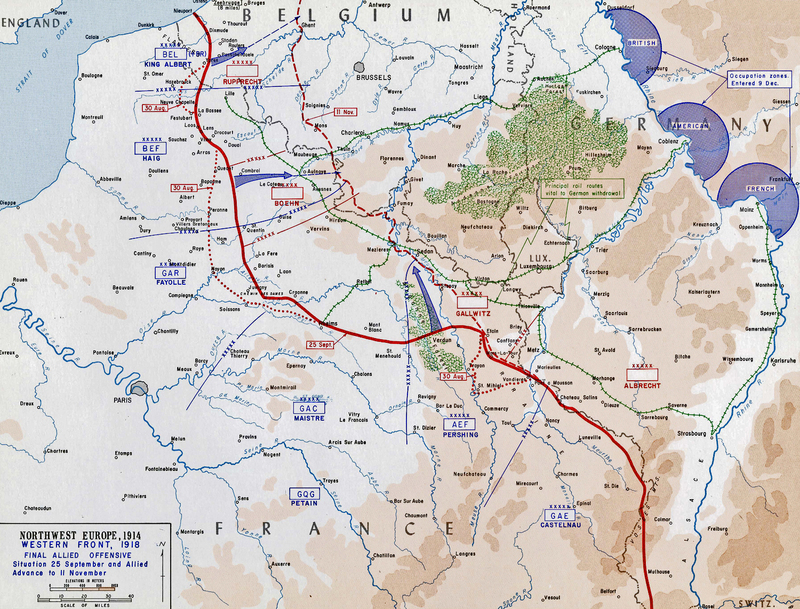 The first phase of the offensive lasted until 3 October, during which period the less experienced Americans gained from 2 to 5 miles, while the French, fighting in more open countryside, advanced their front some 9 miles. 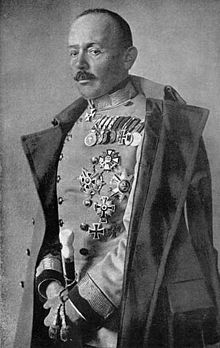 These bare words, of course, cover many French villages being destroyed and many men giving their all, at a time when even the Kaiser knew the war was lost. 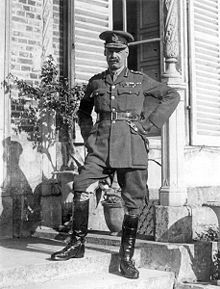 Pershing immediately recognized that clearing the Saint-Mihiel salient was nothing at all like frontally assaulting well-established German positions. 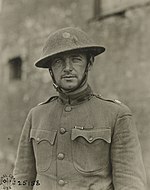 On the other hand, the German veterans were impressed by American aggressiveness and the willingness of the doughboys to charge into machine gun fire. 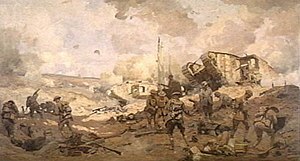 On 28 September the second –and weakest – thrust of the grand offensive, the Fifth Battle of Ypres, was launched far to the north in Flanders. 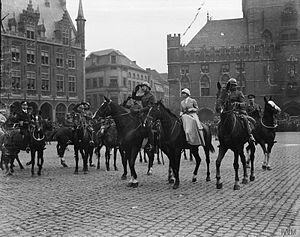 12 Belgium, 10 British (Second Army) and 6 French divisions (Sixth Army) under the command of King Albert of Belgium struck east from the Ypres area, heading towards Passchendaele and ultimately Ghent. 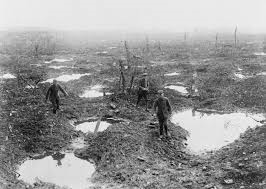 Initially faced by no more than 5 German divisions, the Allies made good progress despite the rough terrain; by 30 September all the high ground east of Ypres and the area west of Passchendaele had been recovered, and by 1 October units were on the Lys River. 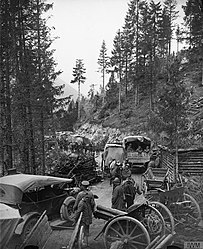 But with German reinforcements arriving and the Allied troops beyond easy supply, the push came to end the following day. 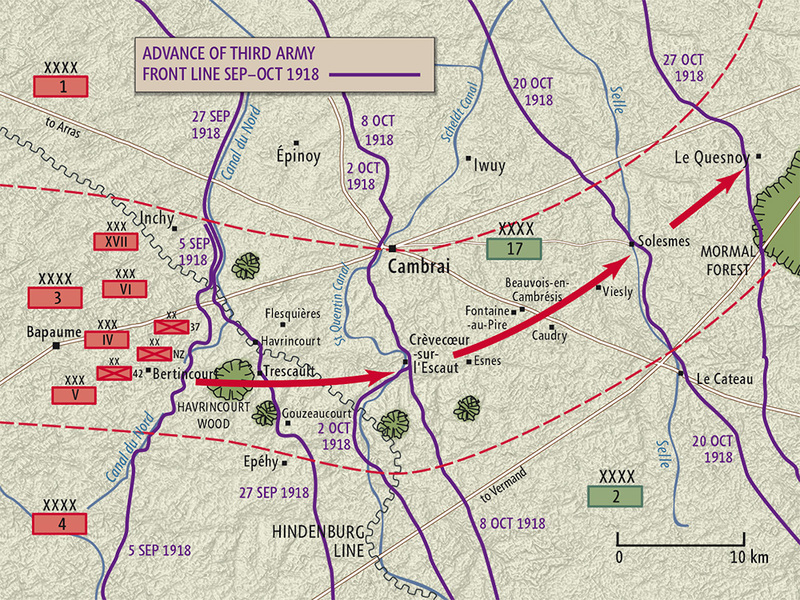 The central thrust pushed off on 29 September, attacking one of the strongest stretches of the Hindenburg Line. 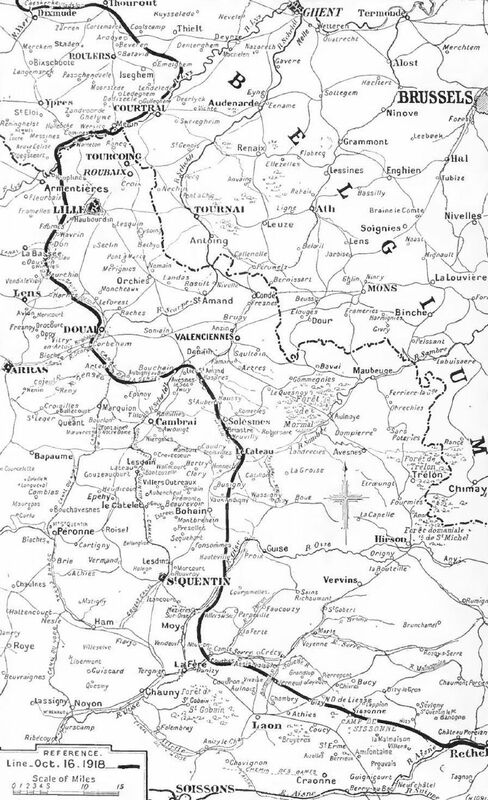 The offensive included the British Third Army in the north and the French First Army in the south, but the British Fourth Army in the center faced the greatest challenge, crossing the Saint-Quentin canal. 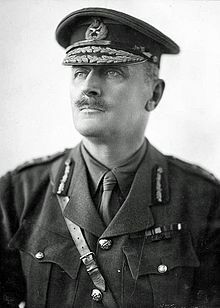 Army commander Henry Rawlinson had 30 British and Australian divisions and two (oversized) American divisions attached to the Australian Corps, and they faced 39 (generally depleted) German divisions of Adolph von Carlowitz’ Second Army and the formidable defenses along the deep cut of the canal. 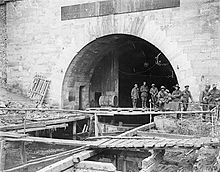 The Aussies and Yanks would confront the particularly strong fortifications at the Bony-Bellicourt sector, where the canal ran underground through a tunnel. 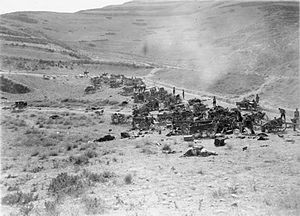 The battle began with 1600 guns firing almost a million rounds, the biggest British barrage in the war. 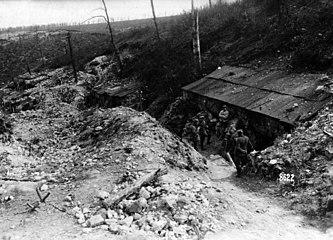 The two American divisions, followed by two Australian and equipped with 150 tanks, headed for the Bellicourt Tunnel sector, their goal the Catelet-Nauroy Line east of the tunnel. 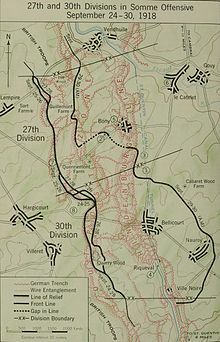 The right half of the advance, led by the American 30th Division, penetrated the Hindenburg Line and by the early morning of 30 September had captured Bellicourt and part of Nauroy, despite taking heavy fire on their left flank because of the failure of the American 27th Division on the left to keep up. 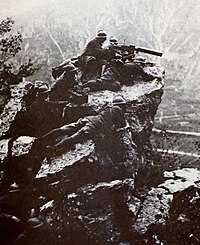 The Australians reported finding large groups of leaderless American troops, who had suffered seriously because of their inexperience. 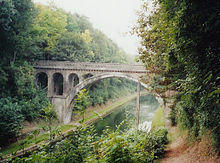 Meanwhile, immediately south of the Americans and Australians the British 46th Division, followed by the 32nd (home of the poet Wilfred Owen), was able to cross the very deep cut of the canal between Riqueval and Bellenglise, crossing the canal with boats, rafts and lifejackets while artillery kept the defenders pinned in their trenches. 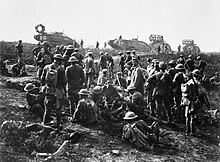 Tanks were brought over the tunnel area captured by the 30th Division and sent south to support the British, who had secured the eastern bank and the German defenses by the end of the day. 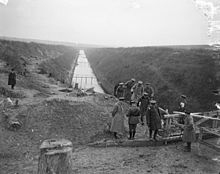 The achievement of the 46th Division was just short of incredible, crossing the waterway with anything that would float, climbing the wall of the east bank with scaling ladders (!) 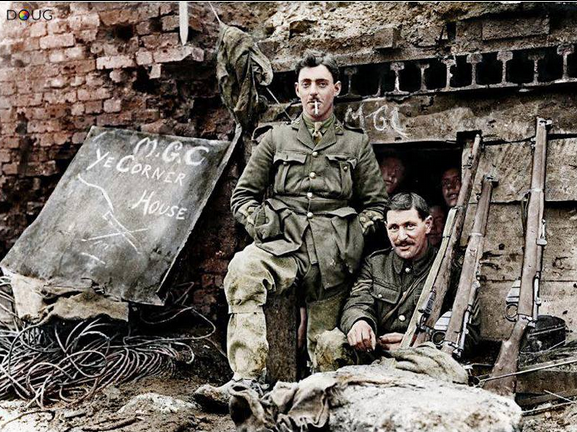 and capturing the formidable defenses – with fewer than 800 casualties. 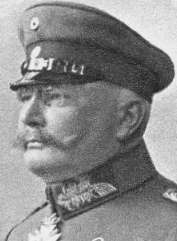 In the east Allenby’s successful and low cost campaign to drive General Liman von Sanders and his Turks out of Palestine continued with the Battle of Megiddo (actually a number of engagements) from 19 to 25 September. 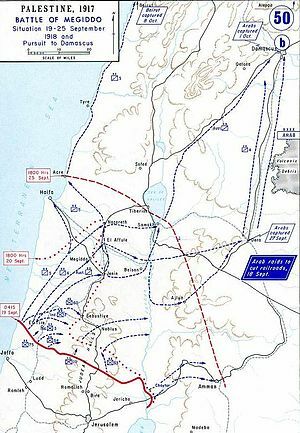 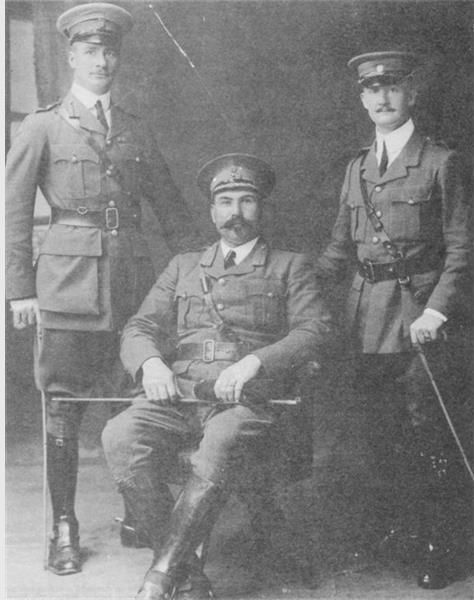 While Lawrence and Arab Revolt units were harassing and disrupting Turkish communications, Allenby’s carefully planned offensive moved rapidly north and east, establishing by the 25th a line running from Acre on the coast east to the Sea of Galilee and south to Amman (Jordan); Australian units would capture Damascus on 1 October. 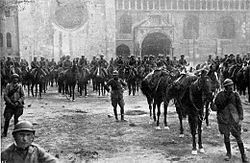 During this roughly two week period 75,000 Turkish soldiers surrendered to Commonwealth forces (many to avoid slaughter by the Arab forces) at a cost of about 1500 casualties; only 6000 Turkish soldiers escaped. 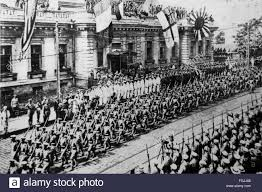 Off in the former Russian Empire Allied forces were on the move. 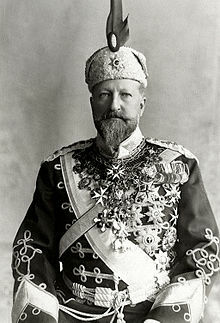 On 2 September an Italian force arrived at Murmansk and was joined two days later by General William Graves and more American troops. 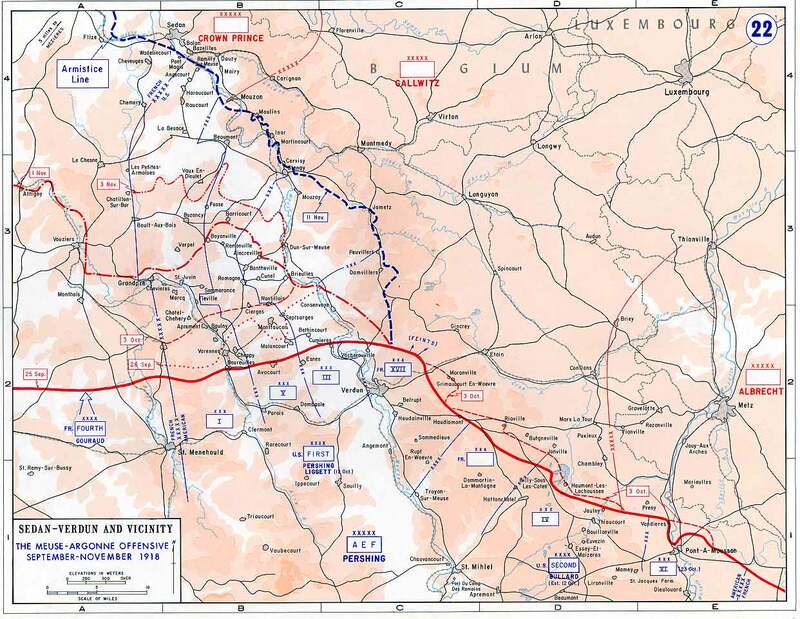 On that same day Obozerskaya, 100 miles south of Archangel, was captured by the Allies, and on the 11th Ukhtinskaya on the Murmansk front. 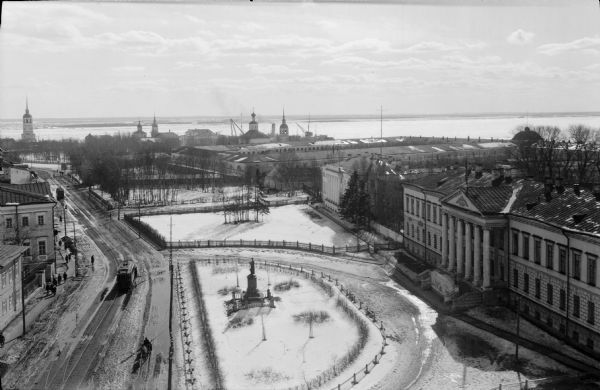 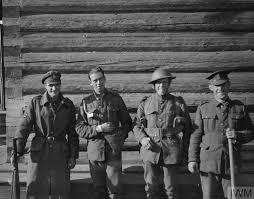 The Canadians showed up in Archangel at the end of the month, by which time Allied troops, aided by Poles and White forces, had pushed 150 miles south up the Dvina River, battling Bolshevik forces on the river and in fortified villages. 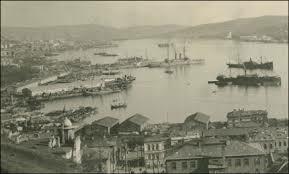 In the far east the city of Khabarovsk, 360 miles north of Vladivostok, was taken by the Japanese on 5 September. 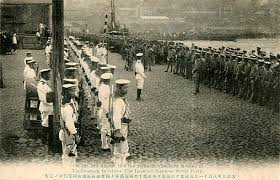 Meanwhile, diplomatic exchanges in September underscored the crumbling position of the Central Powers. 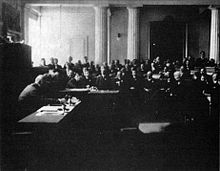 On 15 September Austria requested from President Wilson the opening of peace talks and Germany actually offered Belgium a peace treaty; unsurprisingly, both were immediately turned down. 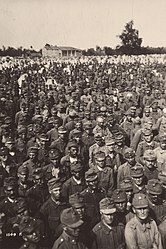 More successful were the Bulgarians, who on the 28th requested of the Allies an immediate armistice, which was granted two days later; Bulgaria was out of the war. 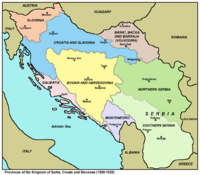 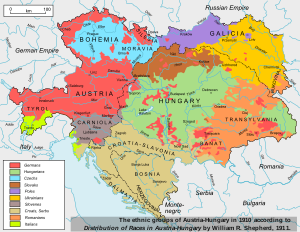 On 25 September Italy recognized the pan-Slavic state – Yugoslavia – that was emerging across the Adriatic as the Austrian Empire crumbled (more on this in October). 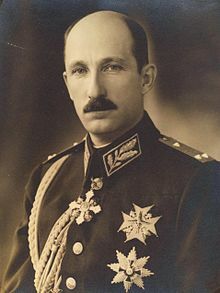 Finally, remember Lettow-Vorbeck and his askaris? 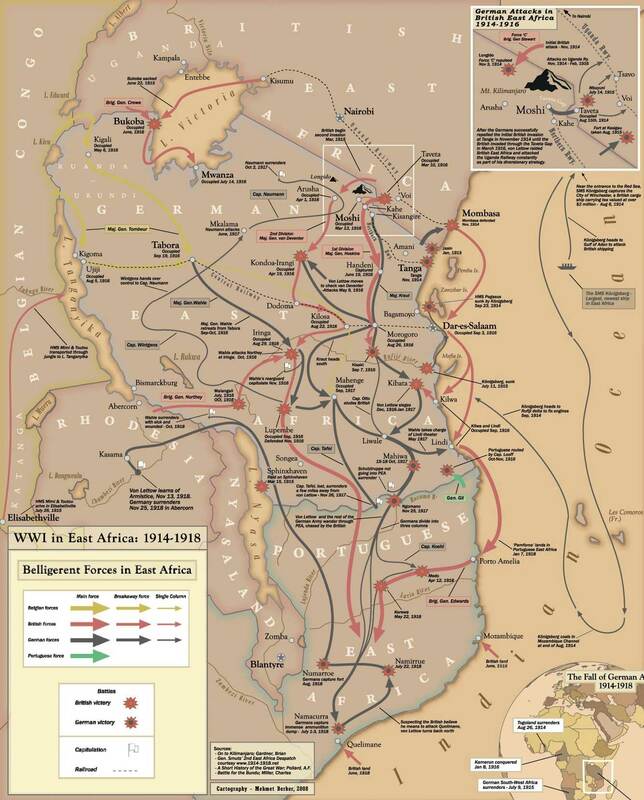 On September 28, nine months and 1500 miles after invading Portuguese East Africa, the Colonel and his ragged but still effective band of mostly native troops slipped across the Rovuma River back into German East Africa. 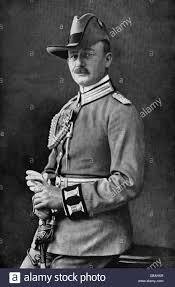 On their arrival the askaris cheered their German leader with “Bwana Obersti anarudi!” – “The Colonel is back!” The game of dodging a quarter million Commonwealth troops went on.